So, I have to be honest. I’m really not a cook or a baker. I started baking only a few years ago because it’s actually really fun. I cooked here & there throughout the years, but didn’t avidly start cooking until a few years ago as well. I am by no means a professional. I’m learning as I go along. And I think the most important thing is that I try. I may fail at my attempts but it doesn’t deter me from trying. I may not cook the best foods or bake the tastiest goodies, but I’m practicing my craft & I’ve definitely gotten better throughout the years. I do have to warn you all, when I cook/bake, I don’t always measure everything. I also improvise a lot, even though some people frown upon that when it comes to baking. I say, who cares. Experiment. That is the only way you’ll discover something new, something tastier, & figure out what works & what doesn’t work. Cooking & baking should be fun, although many find it to be a chore. I enjoy my time in the kitchen as long as everyone leaves me alone to the task at hand. Prepare a round 8″ pan & line with foil. You can use a 9×5 load pan but I was too lazy to find mine. 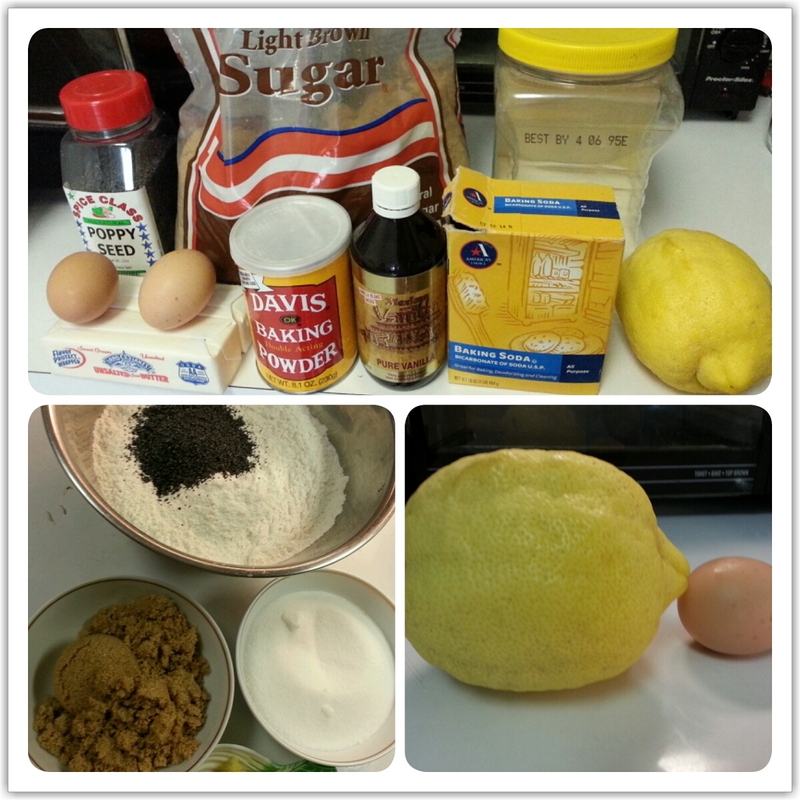 In a medium bowl, whisk together baking soda, baking powder, salt, cinnamon, nutmeg, flours & oatmeal. In a separate small bowl, mix together coconut oil, eggs, bananas & vanilla until combined. 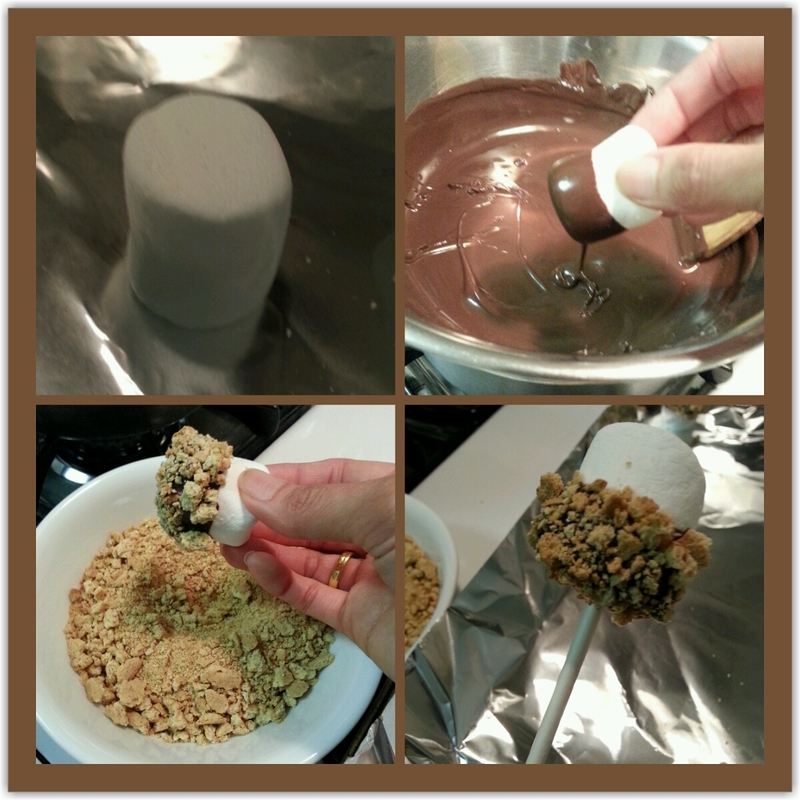 Add wet ingredients to the dry & fold together with a spatula until combined. Do not overmix. Pour batter in prepared pan & bake for 25-30 minutes or until set in the center & a toothpick comes out clean. Let cool in pan for about 15-20 minutes before removing to a wire rack to cool completely. 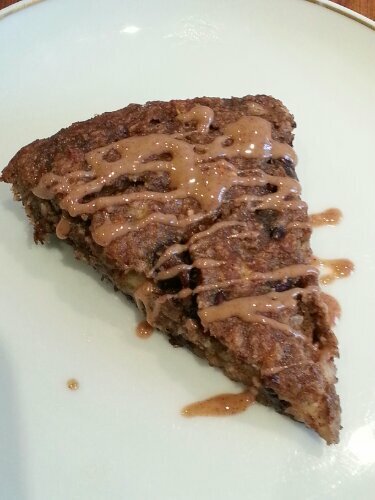 Drizzle with some almond butter before serving. 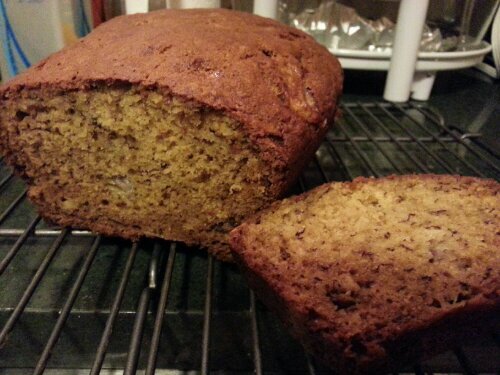 Munkie says the best thing to do with really ripe bananas is to make Banana Bread! You can freeze them until you have enough to make a recipe. They are at their sweetest before they start rotting. 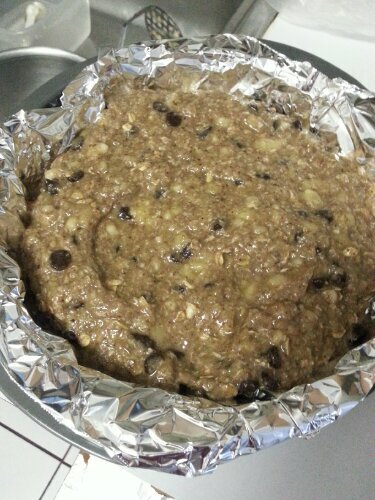 I searched online for a one-bowl banana bread recipe that doesn’t require a mixer. Unfortunately, I didn’t have a potato masher on hand to help with mashing the bananas. Instead, I broke them into smaller pieces & then used a fork to mash them up, which worked perfectly well, but required more work. Melt butter in microwave. Mash bananas in a large bowl. 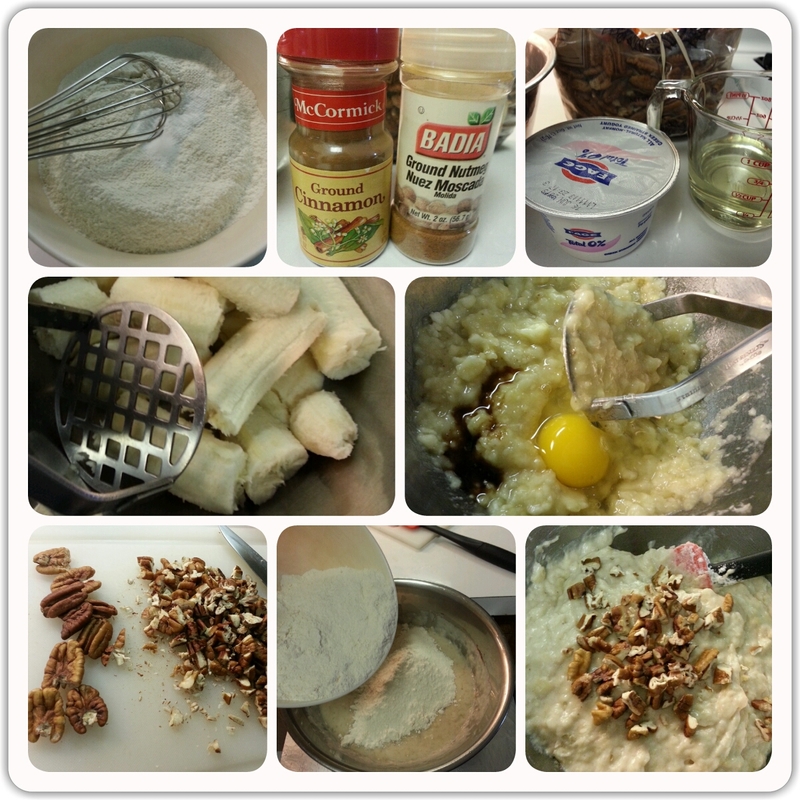 Mix butter into bananas with a large spoon. Add sugar, egg, vanilla, baking soda & salt & mix together. 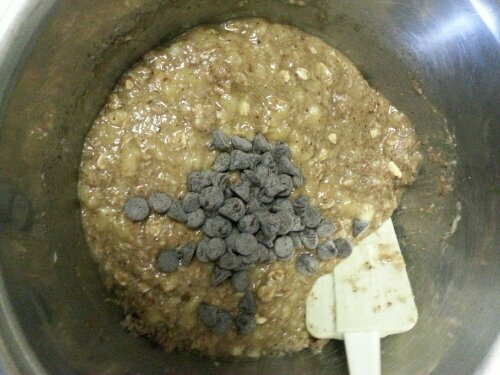 Add flour & mix until just incorporated. Do not overmix. 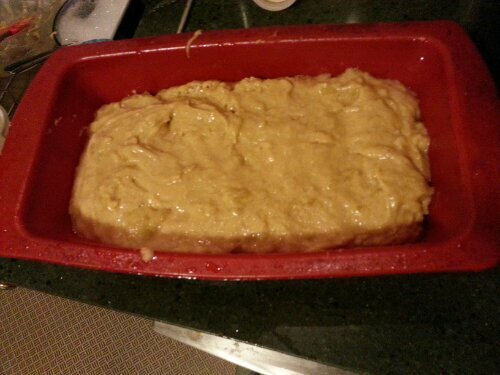 Pour mixture into a buttered 4×8 inch loaf pan or an unbuttered silicone loaf pan. Bake for 1 hour. Remove from pan & cool on a rack. Cool on a rack. This recipe tasted better a day later. Initially, the top came out crunchy, but after sitting overnight, it softened. The bread was perfect for breakfast with a cup of coffee or tea. You can heat it in the microwave for a few seconds which makes a nice warm treat. 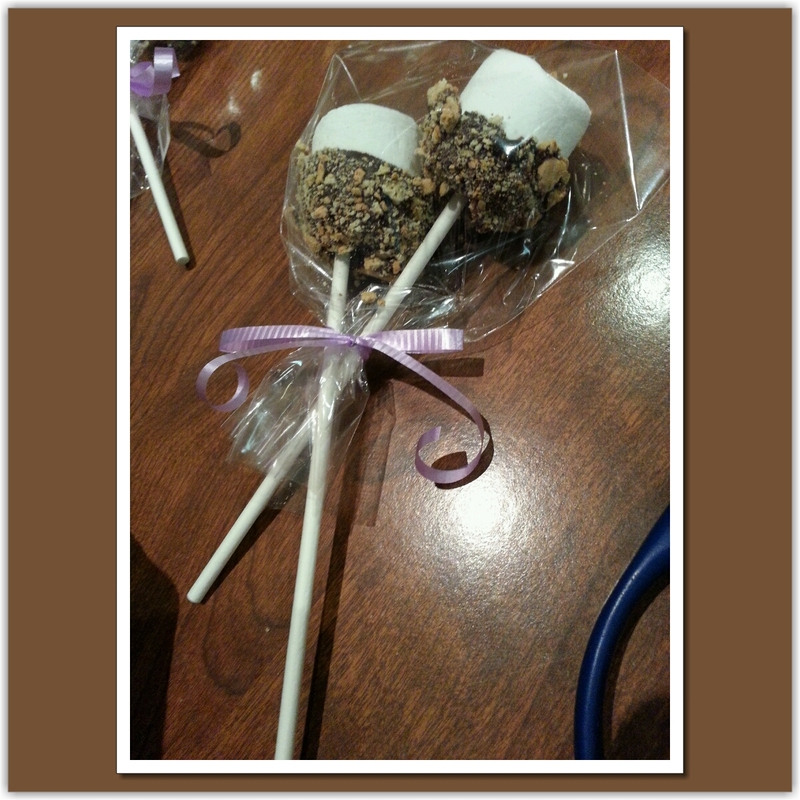 It wasn’t too sweet either, perfect for my taste buds. This went great with a glass of banana milkshake, too! 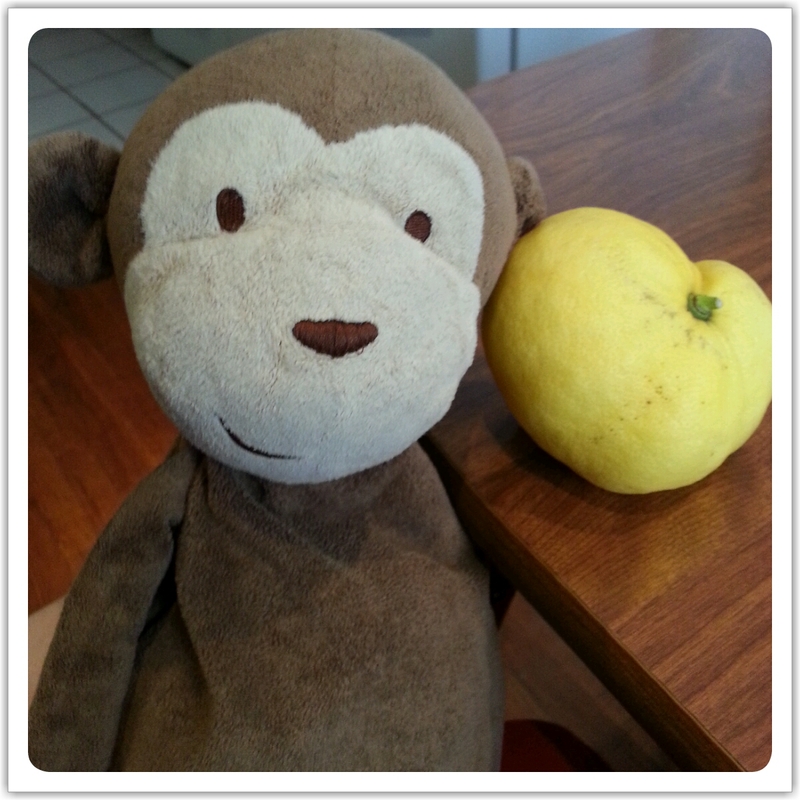 This lemon is about 1/2 the size of Munkie’s head. Believe me, Munkie has a big head! 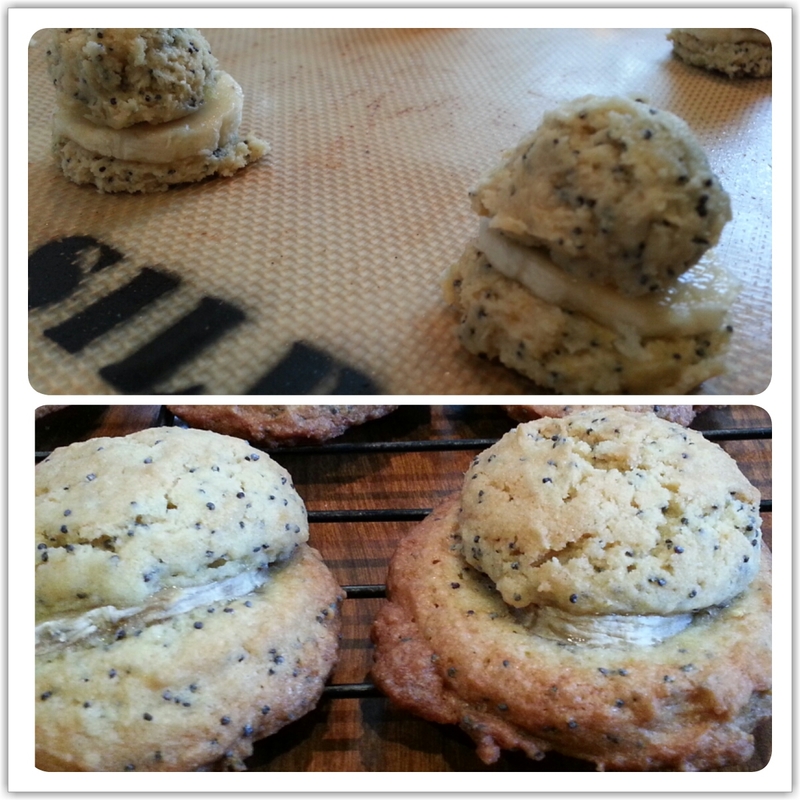 When life gives you giant lemons, you make lemon poppy seed cookies! So the BIL came back from California with these amazingly, unbelievably ginormous lemons. They are mutants, I tell you. I’ve never seen such a monstrosity in my life. At least the lemon wasn’t this huge, otherwise it would have scared the crap out of me. I figured I should bake something with it. 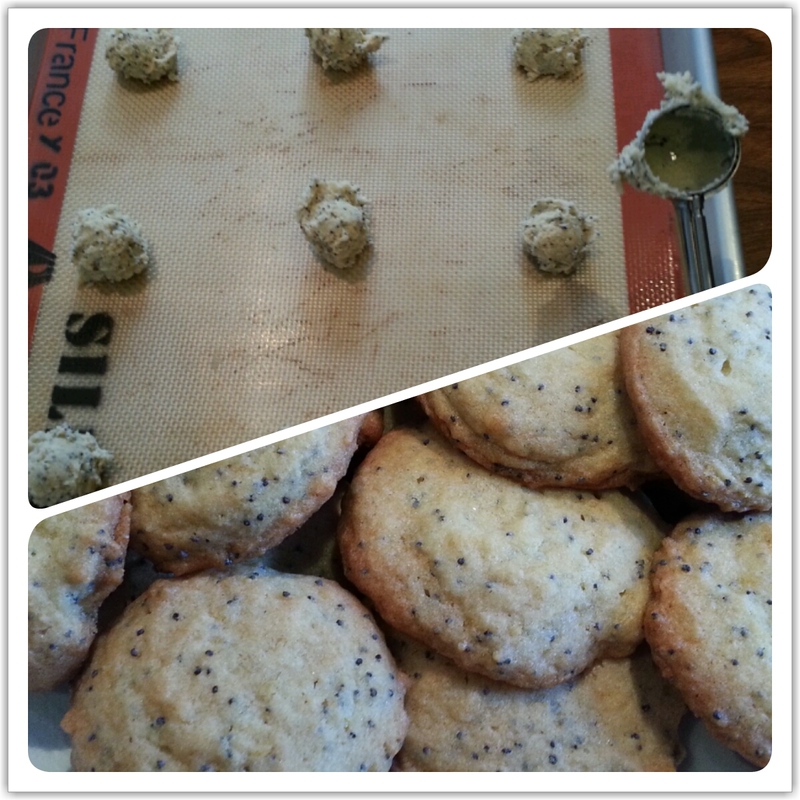 I decided on lemon poppy seed cookies. The preparation & ingredient list was simple, which was a major selling point to me. I wasn’t in the mood to be in the kitchen for hours on end. Line your baking sheets with parchment paper or a Silpat. In a large bowl, sift your dry ingredients (flour, salt, baking powder, baking soda). 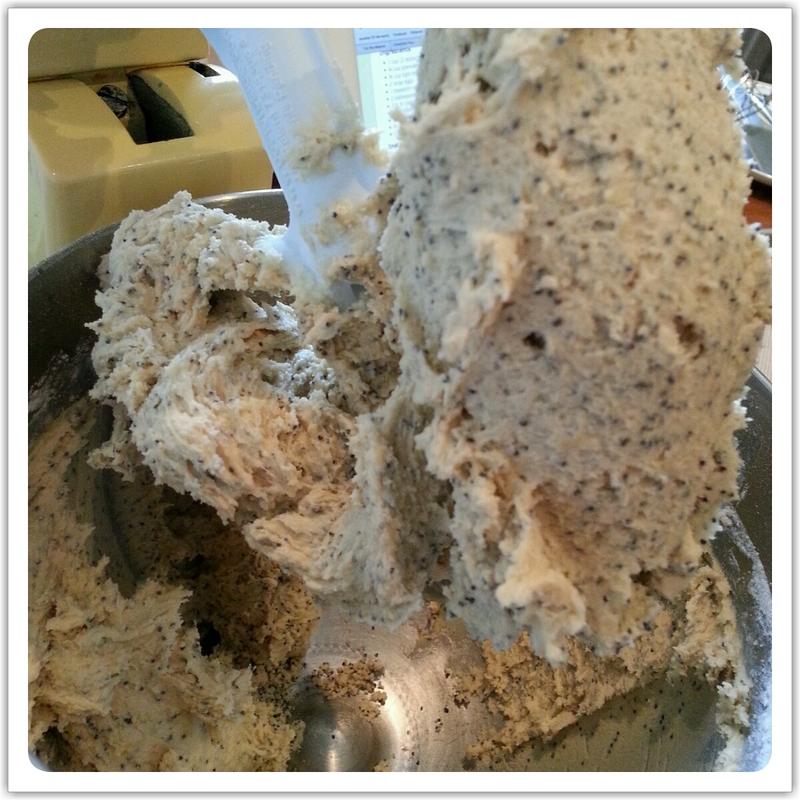 Add poppy seeds & use a whisk to mix them all together. Use a stand mixer to cream butter and sugars together until fluffy (~1-2 minutes). Add eggs one at a time & beat each egg until it is incorporated. Add vanilla & lemon zest & mix. 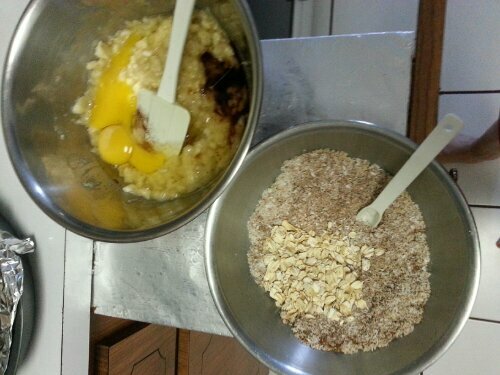 Add your dry ingredients into the butter mixture & mix until combined (do not over mix). I have a small cookie scoop (about 1 tablespoon each), so I made more than 3 dozen cookies as stated in the original recipe. Place each scoop an inch away from each other on the baking sheet. Bake for 11 minutes (may be longer if you have a larger cookie scoop), rotate pan halfway through until the edges are browned. The time depends on your oven. Take them out & slide the cookies off the baking sheet onto a cooling rack. Let them cool completely. They can be stored in an air tight container for about a week. The cookie is not as chewy as I would have liked, but they are still delicious. The poppy seeds add a nice crunchy texture to each chew. The cookies are 2 bite sized. They’re not very sweet & would make a perfect treat with a cold glass of lemonade on a warm spring day. My 2 friends nearly devoured 20 of them within 15 minutes. 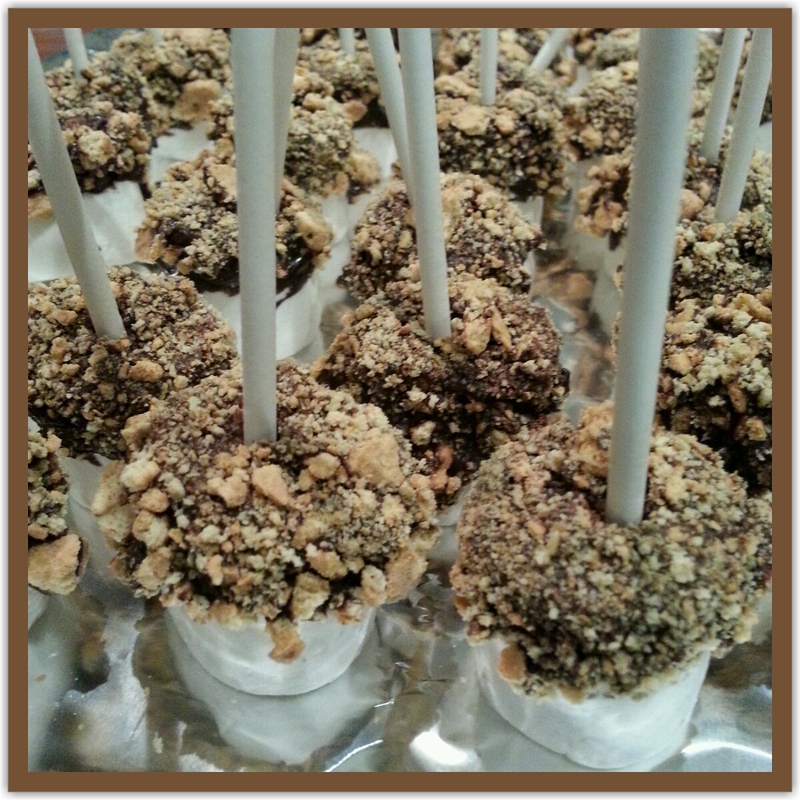 Somewhere in the middle of baking, hubby told me they would taste better with bananas. 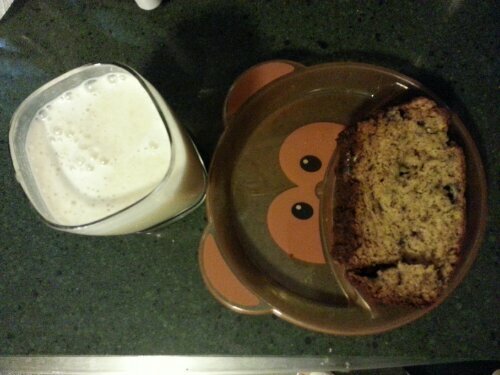 Given that brilliant idea, I decided to mash my cookie dough in between a slice of bananas. Banana version 1 – Scoop dough onto Silpat, with slightly damp fingers, flatten first layer, add sliced banana, scoop dough on top then pat down all sides to cover banana. Bake 14 minutes. The MIL really liked this version. She loved the taste of the lemon. I’m not quite sure if she noticed there was a piece of banana in the middle. Hahaha The banana incorporated so well with the cookie that you might not even notice the banana in the middle. It makes the cookie more moist, which was very pleasant. 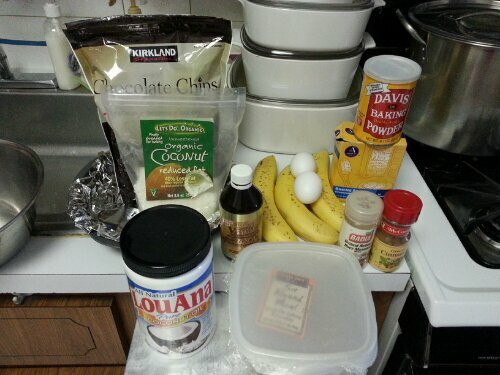 Banana version 2 – Just plop cookie dough down, add banana & plop cookie dough on top without flattening. Bake 14 minutes. Hubby & I preferred this version that I decided to concoct on the fly. The banana added a surprise to your bite. Since they are technically 2 cookies, the one on the bottom bakes faster & gets a crunchy bottom, while the top cookie stays soft. 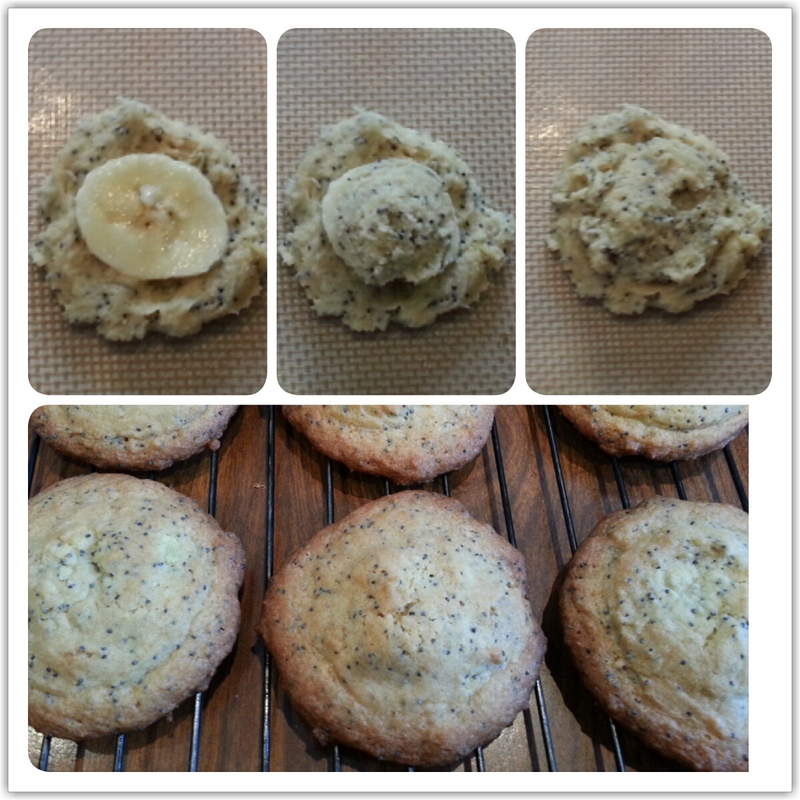 The banana stays soft in the middle & peeks out between the 2 cookies, which makes for an interesting looking cookie. The cookie has a nice contrast of textures. You get the best of both worlds; a crunchy & soft cookie all in one. The banana versions do not keep as well since there’s more moisture trapped inside the cookie. Once you put them into an airtight container, they lose their crunchy bottoms. I’ve decided not to leave them out too long at room temperature because I’m afraid the banana might rot, so I’ve left them in the fridge. They retained their soft cookie structure, but they’ve definitely lost the crunchiness that I so crave. Let me know how you like this cookie. ENJOY! I made this recipe this past weekend & it looked to be a success. In a large bowl, sift flour & combine dry ingredients (flour, sugar, baking soda, salt, cinnamon, nutmeg). Use a whisk to make sure the ingredients are mixed thoroughly. In another bowl, mash the bananas. Add egg, oil, Greek yogurt and vanilla; mix well. Stir in the dry ingredients just until moistened. 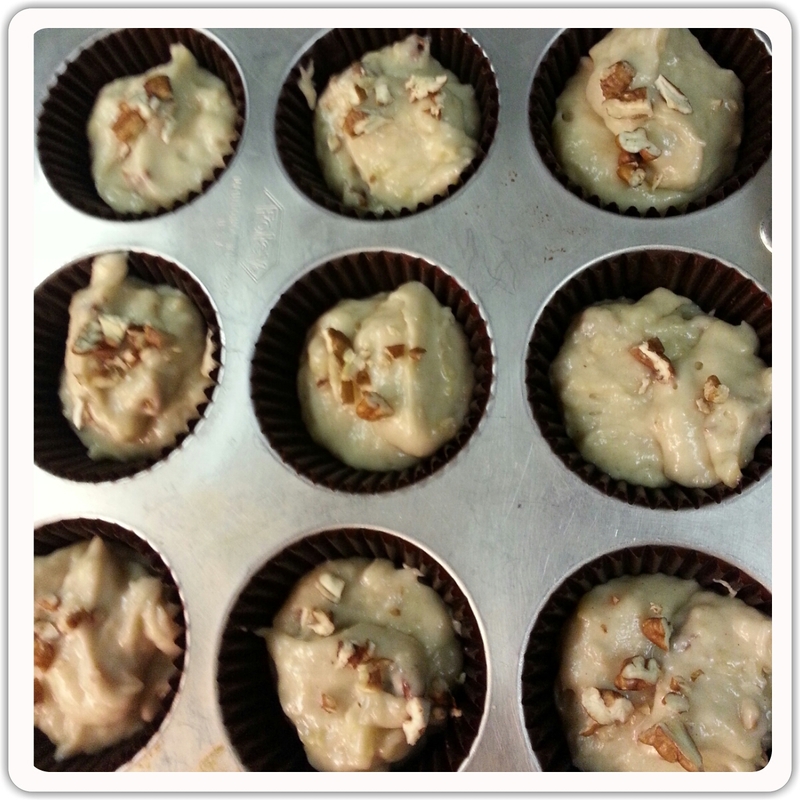 Fold the pecans into the mixture. Fill greased or paper-lined muffin cups 3/4 full. 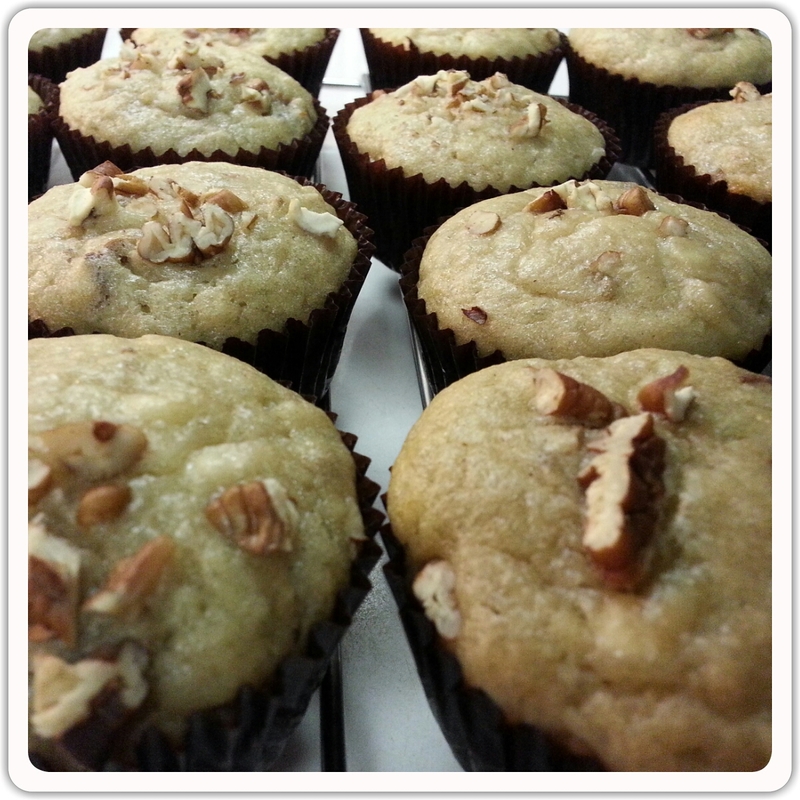 Sprinkle your remaining pecans on top of each muffin. Bake at 375° for 15-20 minutes or until a toothpick inserted near the center comes out clean. Check at 15 minutes, then continue to check every minute or so because you don’t want it to overbake. Remove from pan to a wire rack to cool completely. Yield: 2 dozen (medium sized muffin liners). Now you have breakfast for your whole family that is healthy & delicious. The kiddies get some fruit in their diet. Just make sure your kids aren’t allergic to pecans. If they are, you can just omit them. They taste best when you’ve cooled them a bit. I hear you can freeze these too, so you can just grab one & pop it in the microwave when on the go for a quick breakfast.